I have been puzzling over these two photos. 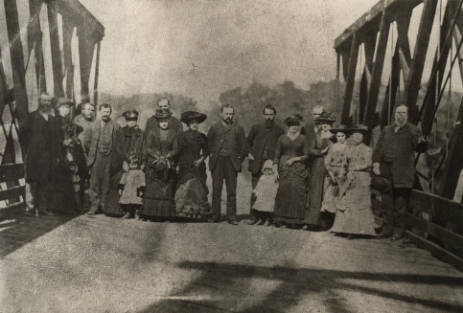 Both come from CSUChico Meriam Library Special Collections, and both show John Bidwell standing with a group of people on a bridge. Where was the bridge? Who are the other people in the photos? The title on this one is “Gianella Bridge”, and the date is 1879. Since the Gianella Bridge, which crossed the Sacramento River at Hamilton City, wasn’t built until 1910, it can’t be that bridge. The description goes on to call it the Sacramento Bridge, the first toll bridge across the Sacramento River, and states that it washed out in the 1883-84 flood. It’s easy to spot John Bidwell in this photograph. He is the tallest man in the picture. At six feet, or maybe 6′ 2″, (descriptions differ), he was much taller than most men of his era. He was also rather portly by this time in his life. The woman beside him is his wife Annie. This is the only photo I can think of that shows them standing side by side, which makes it the best photo to demonstrate the difference between their heights. Annie was 4′ 8″, which is quite small today, but not very much shorter than many other women in her day. It looks like the same bridge to me in both photos. Is it a bridge over Chico Creek or over the Sacramento River? If anyone knows, let me know. President Hayes visited Chico while on a tour of the western states in September 1880. Hayes is on the left, and the woman next to him is presumably his wife, Lucy Hayes. That is definitely John Bidwell on the right. Who could mistake him? And it looks like it might be Annie next to him, except that Annie was not at home when the president came to call. Annie was on an extended visit to her family in Washington D.C. when the president took his western tour. She left it up to John to entertain the president, and he called on other leading ladies in the town for assistance. So that’s not Annie. The note with the photo also says that General Sherman is in the picture. I’d like to know which one he is. William “War is hell” Tecumseh Sherman accompanied the president and should be in the picture, but none of these men look like him. Here is a picture of him taken during this period. I don’t think any of these men is a good match. Lots of questions for two old photographs. What do you think? This entry was posted in bridges, Rutherford B. Hayes, William Tecumseh Sherman. Bookmark the permalink. I believe the bridge in your photographs was the Chico Free Bridge, crossing Big Chico Creek near the Sacramento River. You can see a photo of this bridge in the Chico State digital archives http://archives.csuchico.edu/cdm/search/searchterm/Bridges/mode/exact . 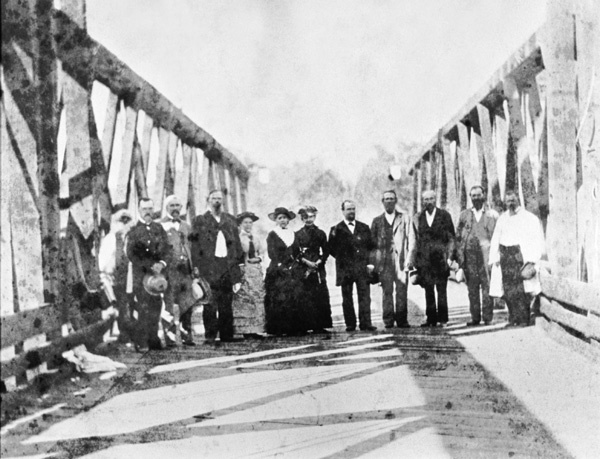 In that photo, there is a group on the bridge at its dedication. If Sherman is in the photo you show, he may be the fourth man from the left, behind the lady’s hat. He was a tall man, and though at the time of the photo is younger than in his portrait photo you show, he had receding hair. On the CSU digital site you can zoom in and see more detail. That may be the bridge. If it was dedicated in 1882 though, could Pres. Hayes have been photographed on it in 1880? Would it have been under construction then? I think you are probably right about the tall man behind the lady being Sherman. It looks like the right hairline, and judging from other photos of him, he was a tall man. He looks to be about the same height as John Bidwell. Too bad he was obscured like that. There is always the possibility that a date is incorrect. Googled reports mentioned Sherman’s soldiers saying he was “very tall”. Someone asked me why these dignitaries came to a “backwater” place. I think John Bidwell had a much bigger resume than most people realize, including (as I have recently read) congressman, gubernatorial and presidential candidate, and Civil War general. Does your research support this? Oh yes. John Bidwell was very prominent in his day and well-known throughout the state as one of the earliest American pioneers in California and the owner of a ranch famous for productivity and agricultural innovation. He was active in state politics, served as a U.S. congressman, and sought the governorship four times (with four different political parties!). His Civil War service was in the California Militia; Gov. Stanford appointed him a brigadier general in 1863. He had known General Sherman for many years. They first met in 1847 near Santa Clara when Bidwell was chasing a runaway horse. Does this look anything like the terrain in the archival photo of Chico Free Bridge (link in earlier comment).? I haven’t been able to find out much about the Chico Free Bridge. I hope one of your readers knows its history. What was important about its location? And I wonder why the name: “Chico Free Bridge”. Did it replace a toll bridge somehow, or a ferry that charged a fee? Bridges must have played an especially important part in Chico’s history. It seems to me the area has more than its share of rivers and streams flowing through it (there’s a LOT of water coming down from the huge watershed on the western slopes of the Sierra Nevada and Cascade Mountains), and in early days a bridge only a few miles away could take hours to get to by horse and buggy. So every new bridge or ferry must have been very welcome to local travelers. One of the names suggested earlier for what seems to have been the Chico Free Bridge, was Gianella Bridge. But the Gianella was a different bridge. It crossed the Sacramento River on what is now Highway 32 linking Chico and Hamilton City. It was built in 1911 and demolished in 1987 and replaced by a modern bridge. Here is a link to a history of that bridge. According to that history, “the Gianella Bridge spanned the Sacramento River here, rather than somewhere else, because the sugar beets were on the left bank and the refinery was on the right bank.” The bridge was informally named after the wealthy farmer Vincenzo Gianella, who owned a sugar beet farm on the Chico side of the river.